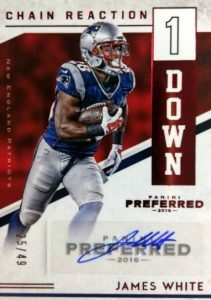 Perhaps a brand more familiar to current basketball fans, 2016 Panini Preferred Football returns to NFL collectors as another hit-focused option. Hobby boxes promise one relic booklet and four signed cards. 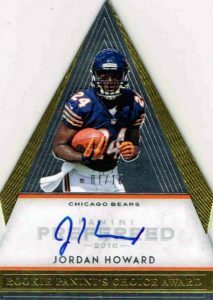 While there isn't a traditional base set, the many autographs make up the bulk of 2016 Panini Preferred Football. Most notable among these are the Silhouettes Autographs with an on-card signature and large swatch for former greats along with current stars and rookies. Prime and Super Prime up the parallel ante with quality pieces. 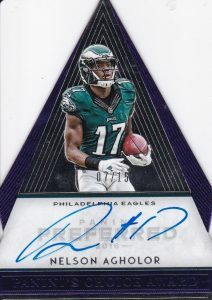 Also extending to multiple eras are the hard-signed Panini's Choice Autographs for both rookies and more seasoned players. Color Guard Autographs specifically covers veteran players and retired greats such as Aaron Rodgers, Brett Favre and Joe Montana. 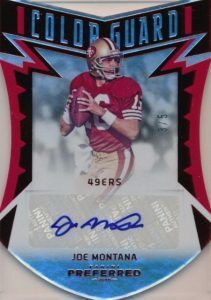 Similarly, Stare Masters looks to past and present with more signed inserts. 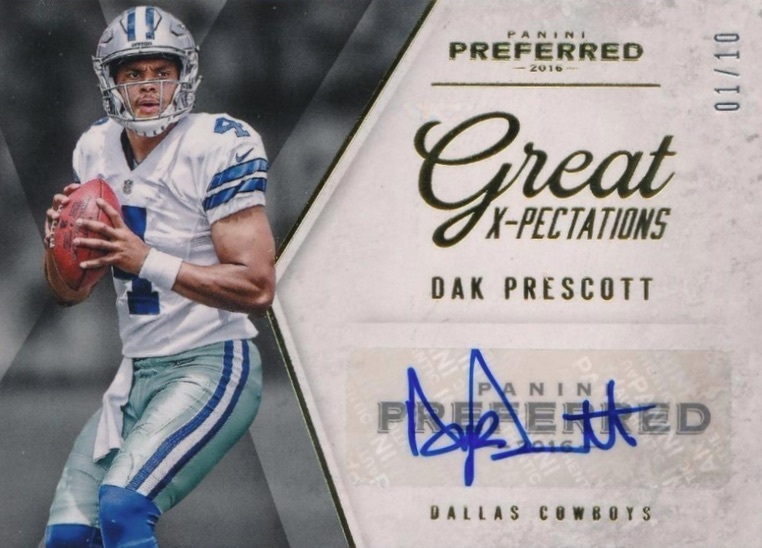 In addition to the autographs, the other major component in 2016 Panini Preferred Football is the various booklet relics. 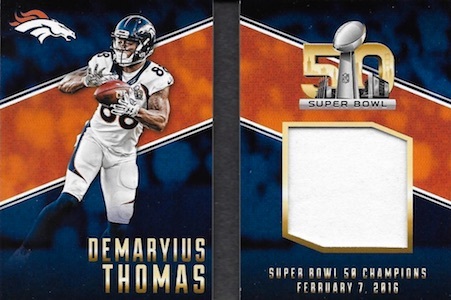 Championship Fabric celebrates the Denver Broncos' Super Bowl 50 win with memorabilia pieces. 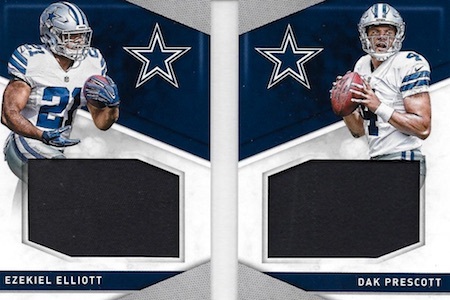 Preferred Pairings combines two connected players and relics in one booklet while options like Pro Bowl increases that total to seven players on one book card. Prime and Super Prime parallels offer limited editions for the various booklets. 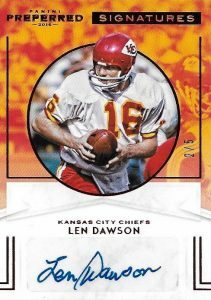 More hit options in 2016 Panini Preferred Football include Chain Reaction and Great X-Pectations. Panini included the retail-only Crown Royale checklist in the final Preferred checklist but the sets are separate so the listings below were removed to prevent confusion. PARALLEL CARDS: Prime #/25 or less, Super Prime 1/1, Printing Plates 1/1. All cards not found in each parallel. View the spreadsheet for full details. PARALLEL CARDS: Prime #/25, Super Prime 1/1, Printing Plates 1/1. PARALLEL CARDS: Blue #/35, Purple #/25 or #/15, Gold #/10, Green #/5 or #/3, Holo Blue 1/1, Printing Plates 1/1. PARALLEL CARDS: Blue #/49, Purple #/25, Gold #/10, Green #/5, Holo Blue 1/1, Printing Plates 1/1. *All cards not found in each parallel. View the spreadsheet for full details. PARALLEL CARDS: Blue #/35 (#247 - #/7), Purple #/25, Gold #/10, Green #/5, Holo Blue 1/1, Printing Plates 1/1. PARALLEL CARDS: Second Down #/25 or less*, Third Down #/10 or less*, Fourth Down 1/1, Printing Plates 1/1. PARALLEL CARDS: *Purple #/25, Gold #/10 or #/5, Holo Blue 1/1, Printing Plates 1/1. PARALLEL CARDS: Purple #/25 or #/15, Gold #/10 or #/3, Holo Blue 1/1, Printing Plates 1/1. PARALLEL CARDS: *Purple #/25 or #/10, *Gold #/10 or less, Holo Blue 1/1, Printing Plates 1/1. 36 cards. The specific text spelled out on each booklet is noted below. PARALLEL CARDS: Prime #/25 or less (No card #27), Super Prime 1/1 (No card #5,19,27,31). How much money is this going to be Trey? 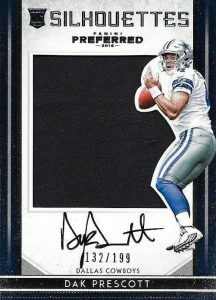 Hunter miles � Looks to be in the $180-200 range for a hobby box. Looks like a really good product. The silhouette autos look fantastic. Plus the retired and vet content. I’m in on this product! How is the checklist not out yet, the day before the product releases. Seriously, Panini has know exactly what’s in this product for months. Why make us wait till release day? These card companies are destroying the hobby. They are part of the retail-only Crown Royale set. For some reason, Panini just decided to include both sets in the same checklist. Ohh okay I get it now. Kinda confused for a bit as Panini had Crown and Preferred in one downloadable checklist. Yep. Odd decision since it would have been so easy and more logical to do two different checklists.